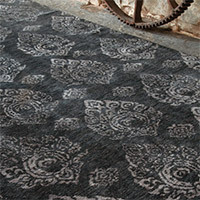 Add a new facet of style to your living space with our Jaunty Rugs. Whether they’re plush, flat woven, round, square or sheepskin, rugs bring luxury and coziness to your room decor. Large ones define the seating area in the living room, runners soften your step in the hallway and door mats welcome you home. They’re a great way to show your personal style and treat your feet to some pliability. We offer you an array of stylish and luxurious rugs that gives a classy touch to your home as well as comes handy if you have small kids and pets in house. At district décor you get the best in class products designed with high quality materials and unique design that complements almost everything in your home. Accentuate your house with wide range of our handpicked inventory.